Annoyed by scraping, bumping, misaligned kitchen or bathroom cabinet doors? Cabinet hinge adjustment is one of the easiest, cheapest fixes you can make to your kitchen and bathroom. Even homeowners who shrink at the sight of a screwdriver and hammer can quickly take care of this frustrating daily problem. Most modern cabinets have fully adjustable hinges with three directional adjustments: up and down, side to side, and in and out (or depth). Most hinges have mechanisms for side to side and depth adjustments, while some are adjusted up and down using the screws that mount the hinges to the cabinet. Others have a mechanism for this, too, and you don't have to loosen the mounting screws. In decades past, you found this kind of adjustment only on "European-style" or frameless cabinets, but now almost all cabinets have adjustable hinges. If each of your hinges has two or more screws in addition to the mounting screws, you have fully adjustable hinges. At the other end of the spectrum are very old and very basic hinges that have no adjustment capability. This is the case with most surface-mount hinges that mount to the front of the cabinet instead of the inside edge of the cabinet face frame or to the inside of the cabinet box. Some basic hinges have up-and-down adjustment provided by elongated screw holes for the mounting screws. Otherwise, non-adjustable hinges must be moved to reposition the doors. When adjusting cabinet doors, your main goal (aside from keeping doors from rubbing or hanging loose) is to make them look right. But this doesn't mean the doors must be perfectly vertical or level or otherwise returned to a factory-new position. It means they look right with the surrounding cabinet elements, particularly neighboring doors and drawer fronts. Often, you end up tweaking doors a bit off-kilter so they work well together and show consistent gaps. This may require a compromise between aligning the outside door edge with the outside of the cabinet and aligning the inside edge with the mating door. The visible gap along any edge of a door or drawer front is called a reveal. When you're checking a door for proper alignment, you're usually checking the reveals, since they form the dark, noticeable lines between cabinet elements. The only tool you really need for adjusting cabinet doors is a standard Phillips screwdriver. Be sure it has a #2 screw tip (there are different sizes), which almost all medium-size Phillips screwdrivers have. Don't use a power drill with a screwdriver bit because the force of the drill can easily strip screw heads or strip out the cabinet wood (often particleboard). If desired, you can ask someone to be a second set of eyes on the cabinets (like when you're straightening a picture), but there's no reason this can't be a one-person job. Open the cabinet door and look at the part of the hinge attached to the cabinet box. Two screws, located at the top and bottom of the hinge, mount the hinge to the cabinet. Turn these screws clockwise to make sure the door is secure. If tightening the mounting screws didn't solve the problem and the door is still too high or low, look for a screw that adjusts the door up and down. 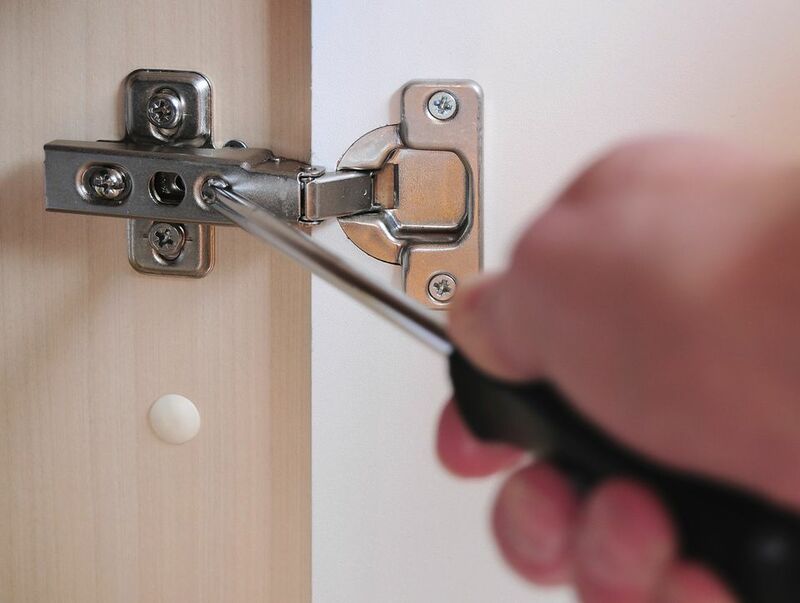 If there is no separate screw for this function, loosen the two mounting screws on both hinges, adjust the cabinet door to the desired height, and re-tighten the screws. Use the side-to-side adjustment moves the door right or left to align the door with its neighbor or with the edges of the cabinet box. You can adjust one or both hinges on each door, depending on how much correction it needs. If the door seems to be tilting down to the right, turn the side-to-side screw on the top hinge so the hinge pulls closer to the cabinet box, moving the top of the door to the left. If that doesn't quite do it, adjust the side-to-side screw on the bottom hinge to move the hinge away from the cabinet box, moving the bottom of the door to the right. Use depth adjustment screw to move the door in and out in relation to the cabinet box. Because wood doors can warp a bit with seasonal humidity changes, a door may pull away from the box at the top or bottom rather than meeting the box flush when the door is closed, causing the door to bounce when it closes. If the door doesn't meet the box at the top, adjust the top hinge toward the cabinet and/or adjust the bottom hinge away from the cabinet. If the door is gapped at the bottom, do the reverse. Close the door after each minor adjustment to make sure you're moving it in the right direction and to see if it needs more adjustment. This is a trial-and-error process, and fine-tuning is the name of the game.